Internships are fast becoming the must have addition to your graduate CV. Whilst Condé Nast (the company behind Vogue) have announced that they will be ending their internship programme in 2014, on the whole internships are still in vogue and are set to grow. A report published by High Fliers Research in January hinted that 1/3 of graduate jobs would be filled by those who’d already worked for the hiring organisation through an internship or period of work experience. This prediction was backed up by research from the Higher Education Statistics Agency which found that 21.7% of those who graduated in 2009 and were in work within 6 months were those who had interned or gained work experience with them. The signs are clear that internships are booming but with them come words of warning. Where something becomes popular, competition is sure to follow and even if you get an internship you’ll need to do something to stand out from the crowd. With that in mind I’ve put together a list of five things you should do to make the most of your internship! 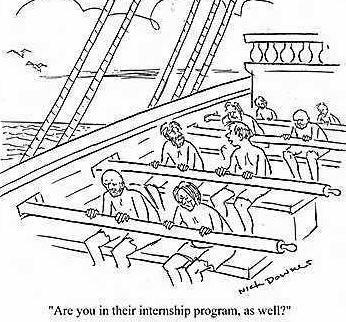 When you start your internship it’s so important that you get off to a good start! Enthusiasm is your friend, use it to show to everyone that you’re keen to get stuck in and learn as much as possible. Building relationships with your fellow workmates will help you to turn from ‘that intern’ to a valued member of the team. Make the effort to get involved with any extracurricular activities whether that’s joining the office football team or popping down to the local pub for a few pints after work. Just make sure you don’t get too sloshed in the process. Feedback on your performance is an essential step in helping you to be the best that you can be. If it’s not forthcoming, consider whether you have built up the rapport to ask for some honest pointers. Once you have your feedback, assess how you can implement their summations into your future development, focusing on key areas that will help you blossom into the best intern they’ve ever had! Once you’ve built up rapport with your fellow co-workers and have proven that you can be trusted, make it known that you’d be happy to take on extra responsibilities. Doing this requires a good relationship with your manager so don’t jump in too soon. If the approach is done right it can be a great way of showing that you’re up for the challenge. Mention your readiness to help in passing conversation and in the meantime excel in whatever tasks are put your way. If all goes well they may start to offer you meatier tasks or even projects that you can take full responsibility of. End it on a high note and maintain the relationships you’ve built up! When it comes to the end of your placement ensure that you thank those that you’ve worked with and maintain the relationships that you’ve developed. Add them on LinkedIn and if you feel you’ve built up enough rapport get their personal contact details and be sure to thank all of the colleagues that you’ve worked with personally. Once you’ve left a thank you letter to the whole of the department/organisation can be a great touch and will help to keep the channels of communication open for when you’re nearing the end of your course. Are you considering an internship and not sure what to do next? Have you rode the internship train and turned it into a full time paid role? Have you got any tips you’d like to share? Let us know in the comments below!